Our large 14ft round In Ground trampoline is our largest trampoline and a great size for growing families or older kids. Our innovative, high specification design is completely flush to ground and will blend seamlessly into your lawn. 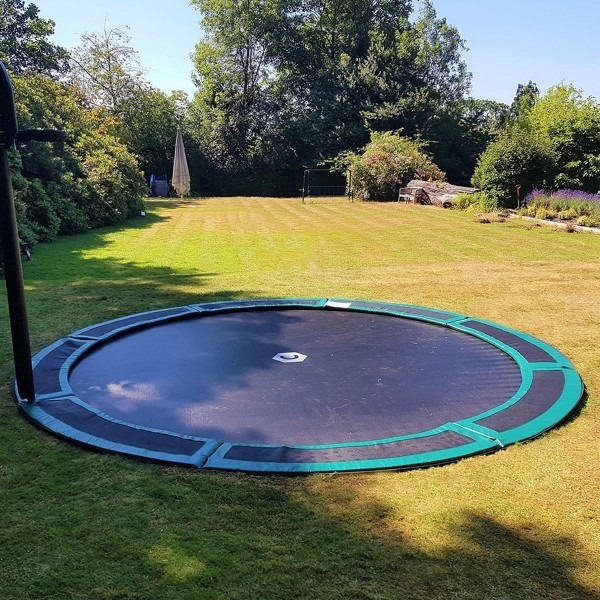 A complete kit – This in-ground trampoline kit 14ft comes with the trampoline and pads, purpose built retaining wall (which stops the soil falling back into the hole) and clear instructions. Your net options – The beauty of an in-ground trampoline kit 14ft is that you don’t need a net at all! However, we also offer a range of net options, including full, half and quarter nets to suit your needs. Easy entry – Kids have the freedom to run on and off the trampoline as they like without having to climb up and down ladders. This is especially great for younger children and means parents don’t have to supervise or help younger children on and off their trampoline.